One of the advantages of the rack is as a safe staging area for a normal or an emergency return. The thought was that the CEV actually arrives at the rack, and parks an earth return vehicle (a gumdrop shaped vehicle like the apollo CSM which is the main crew vehicle on the front of the CEV) on the rack for the return. Now a lot of views of the CEV show it as a kind of integrated unit with the gumdrop shaped crew vehicle on the front. Once attached to the rack this return vehicle can be cabled to the power systems of the rack but has its own fuel supply and rocket for lunar-earth transit (but could refuel from the rack too or get more oxygen). This vehicle would be parked on the rack where the initial buried pressurized hab was. Better to do an apollo style ballet move wherein the gumdrop earth return crew vehicle section pulls away from the CEV motor stage, turns around and docks with the pressurized lander, pulls it out of the CEV motor stage shroud then docks the whole assemblage to the rack (is grabbed by the arms after its RCS puts it in range), so that the earth return gumdrop motor is actually facing toward the rack with the docking cone end is facing away for easy access to the lander. The crew transfers to the lander and off they go. Just thinking out loud (in text) here! I think this is the most viable approach (Von Braun was right!). The only thing different from this and Apollo is that 1. this ballet happens in lunar orbit instead of earth orbit, 2. there is a prepared base with telerobotics facilities to go to and 3. the return vehicle is parked on this rack in lunar orbit and contains backup services. The crew upon reaching the surface could transfer into the buried hab for a safe stay while using the other lander as the return vehicle and a backup hab. Ideally the return vehicle would be physically connected to the buried hab but this may be too complicated a move to do early on. If needed the buried hab is a backup return vehicle as it keeps its onboard rocket fuel. Of course it would have to be unburied somewhat or be able to use its motor to push the material off (a bit of risk there). 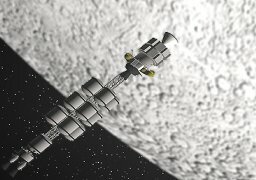 Oxygen could come from either lander or even the dual rover package could have backup oxygen on board. Ultimately any crew rotating through the base would fill up with spare oxygen at the rack as well. 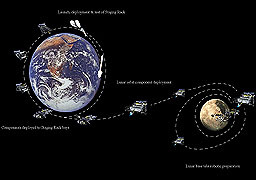 On leaving the Moon, the crew would use an apollo style launch to and rendezvous with the gumdrop shaped (with motor/tanks of its own) return vehicle parked at the rack. That vehicle detaches and motors away for a fast return to earth or docking with the ISS but most likely return via direct descent like Apollo. The Earth return vehicle is always available on the rack (presumably easily accessible) with extra power, oxygen etc. Over time more vehicles/rovers and supplies would parked at the rack by subsequent CEV visits. The rack is therefore a service station (not a space station) for all phases of surface mission support. [Click here] to go back to the main page.